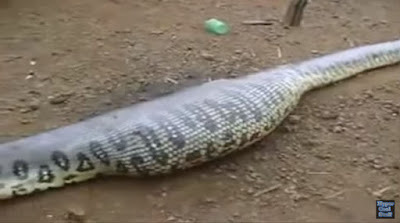 Home / News / Video / They were shocked to see what's inside this Anaconda's stomach! They were shocked to see what's inside this Anaconda's stomach! 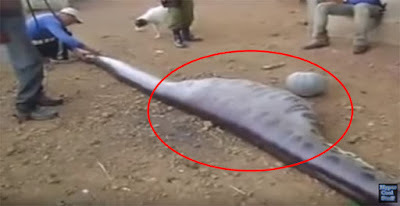 Watch what horrifying animal was found inside this giant Anaconda's stomach. This must be the reason why he died! Unbelievable! There have been many reports and videos showing giant snakes specially Anacondas eating and digesting big animals! Some of these snakes luckily survive but there are some who died maybe because they didn't digest it properly. 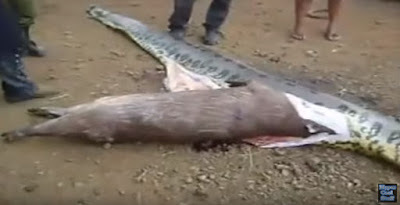 In this video, uploaded by Hyper Cool Stuff on YouTube, a dead snake which was believe a giant Anaconda was found lifeless at a Farm in Pará State Brazil. You can see the big bump on the snake's stomach, that must be the reason why it died. After inspecting the snakes body, a man finally decided to cut it's stomach slowly to see what's inside of it. The man carefully cuts the snake's outer skin with his knife. Then finally cuts off it's inner skin where you can see the lifeless Capybara slowly getting out from the snake's stomach. Until the man had cut off the entire stomach and the dead rodent was removed from it. The snake was believe to be 7ft long. This is not the only news about an Anaconda eating a big animal. There was this news where a giant anaconda was captured throwing up a cow, then there's this one which a snake was seen also regurgitating a dead goat! It's really horrifying and scary to see this kind of incident because it just shows that these snakes can eat and kill anything they see or they want!